HP Umpire Bill Miller ejected Diamondbacks Hitting Coach Dave Magadan for arguing a check swing (strike three) call at the conclusion of the top of the 9th inning of the Diamondbacks-Rockies game. With two out and none on, Diamondbacks batter Yasmani Tomas attempted to check his swing on a 3-2 slider from Rockies pitcher Adam Ottavino. Ruling was reviewed and affirmed by the UEFL Appeals Board (6-0-2), the call was correct. 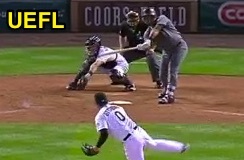 At the time of the ejection, the Rockies had won the contest, 14-7. This is Bill Miller (26)'s fifth ejection of the 2016 MLB regular season. Bill Miller now has ? points in UEFL Standings (11 Previous + 2 MLB + ? Call = ?). Crew Chief Bill Miller now has ? points in Crew Division (4 Previous + ? Call = ?). This is the 149th ejection report of the 2016 regular season. This is Arizona's 5th ejection of 2016, T-1st in the NL West (ARI, COL 5; LAD, SF 4; SD 3). This is Dave Magadan's first ejection since September 19, 2011 (Mike Winters; QOC = U [Fair/Foul]). This is Bill Miller's first ejection since August 12, 2016 (Craig Counsell; QOC = Y [Balls/Strikes]). Wrap: Arizona Diamondbacks vs. Colorado Rockies, 9/2/16 | Video available via "Read more"
Ask the UEFL - What Happens After UIC Gets Hurt?